Today, we are so excited to introduce you to an early release of our new content making tools - these improve the mobile-friendly, responsive websites you can build now, by providing full-width capabilities, parallaxing and more design options for your online business. Now you can build an amazing looking, full-width website within minutes. Having helped over 30,000 businesses, entrepreneurs and makers launch an online presence, we’ve listened to your feedback and learned what it takes to help you succeed. With our new content maker, we hope to empower more of you, to do more of that. A new selection of content building tools designed to help making a beautiful website, easier than ever. Similar to our current tools, you will build your page and content by using a drag and drop functionality. 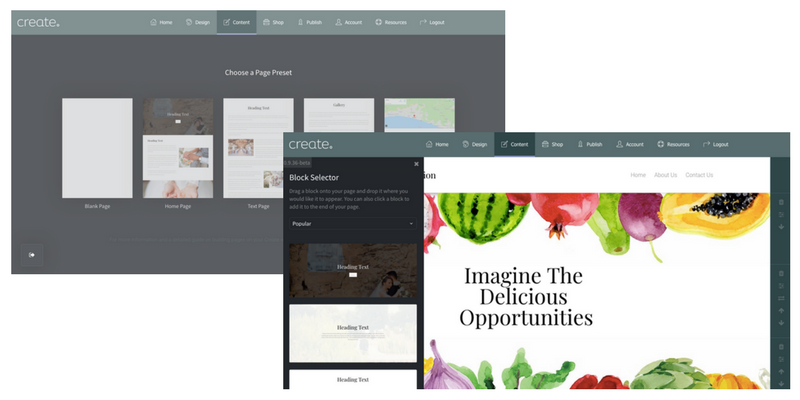 All new ‘preset pages’ will make it even easier to start and build your website. 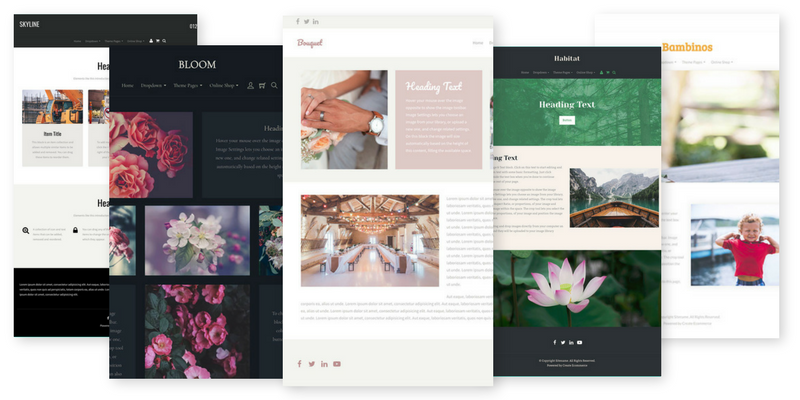 With expert design influences behind each one, you can relax knowing your preset page will contribute to a beautiful layout. 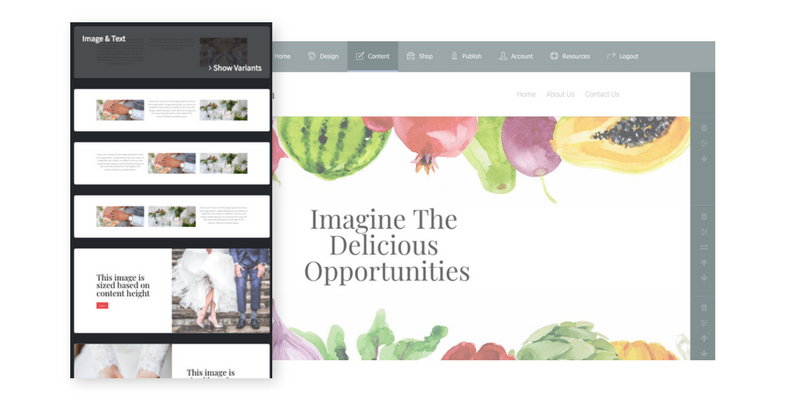 A selection of ready-made blocks will help you visualise how your content and layout will look, before you’ve even started. Save time moving all your elements around, by choosing your favourite block style. New templates have been specially designed and added to compliment the new content tools. Whether you want to create standout content using animations, full-width images or parallax scrolling - these professional website templates will showcase your content beautifully. On-page Header and Footer editing has been designed to help you customise these whilst previewing the outcome on the Design screen. With new Header and Footer block options you can choose the ideal look and content for your brand - find out how to edit yours. Image adding and editing tools have been designed to give you more control and flexibility. 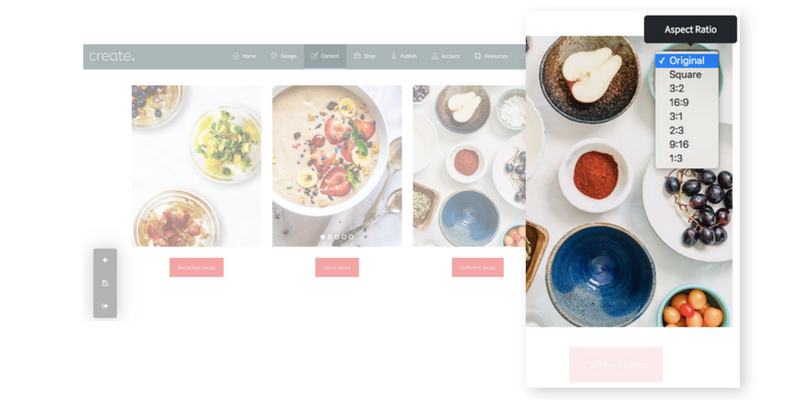 Edit on-page image settings with ease, crop and align images or turn them into slideshows and galleries to create the perfect look. To show you what can be achieved using our new content maker, check out our inspiration website and have a go with your own Create website. We think it's important that our users help us shape the tools they use here at Create. So we wanted to share this with you as soon as possible, with an early BETA release. This allows us to gather your feedback on the development of this feature so far, and so any changes you see to come will be based around that feedback. Want to build a stunning website? You can access this early release from today! Begin by adding a new Content Page to your website from the ‘Content’ menu in your Create account. Log in to your Create account or start a free trial to get started. For more information, download this in-depth overview on the new content building tools and work alongside side it whilst building your site. Let us know what you think! We’d love to see what you build with these new tools so please leave your website in the comments below and feel free to get in touch with your Account Manager if you have any questions.